If you’re looking for an elegant and comfortable place to stay during your visit to Rhode Island’s Westerly, there’s nowhere quite as inviting as Ocean House. Located in scenic Watch Hill, the historic resort has been opening its doors to guests for more than a century. Ocean House combines a rich heritage with unrivaled luxury and a supremely individualized service. As well as sumptuous rooms and signature suites, you will enjoy Ocean House’s farm-to-table cuisine, and indulging int heir award-winning spa. There are also a host of daily resort activities, so you’ll never be short of something to do; whether it’s picking up new cooking techniques, touring the beautiful art collection, or enjoying a wine tasting. The ocean-side village of Watch Hill is an unspoiled destination, a place where you can leave behind all the stress and noise of the everyday. Enjoy relaxing on the scenic beaches, browsing or shopping in the unique boutiques, or just taking in the refreshing ocean air. 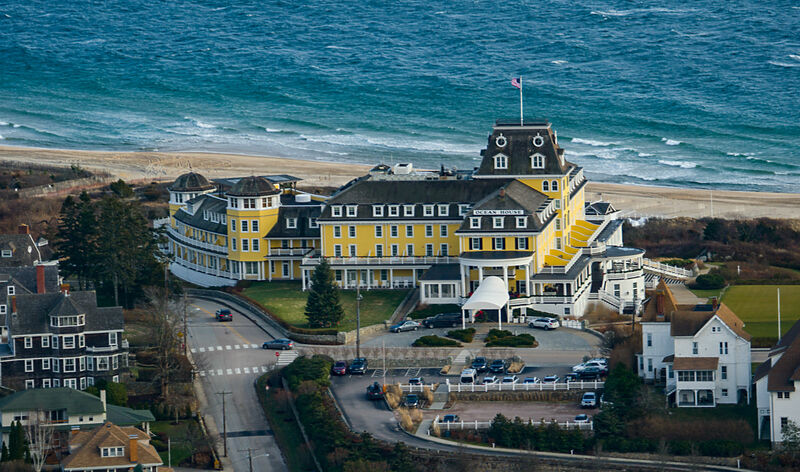 As the 19th century dawned, a number of hotels sprung up along the New England coastline. Guests were eager to escape the sweltering cities and spend their summers by the ocean. The Ocean House opened its doors in 1868, following the culmination of the Civil War. For families who could afford to travel to the beach during the summer months, Ocean House became a summer haven to many distinguished guests. The impressive Victorian guesthouse was a popular resort and continued to be so for generations to come. In 1916, Ocean House was immortalized in the film American Aristocracy, which starred favorites like Douglas Fairbanks Jr. and Jewel Carmen. For 135 years, Ocean house continued to welcome guests old and new. Sadly, time took its toll, and in 2003 the hotel closed its doors because it was in dire need of repair. In 2004, a new building was designed, which reproduced the hotel’s original exterior. Today, the hotel has been replicated to encapsulate the romance and elegance of its past. The new hotel is home to 49 distinctive rooms and 18 signature suites, allowing more spacious rooms than the former hotel, which had 159 accommodations. From the outside, the hotel’s 247 windows remain in their original positions, affording breathtaking views of the surrounding area. The resort has been able to retain many furnishings and artifacts from the original structure’s historic interior. Ocean House is nestled within 13 acres of stunning oceanfront landscape overlooking a private 650-foot beach covered in pristine, white sand. Guests can enjoy views of Block Island, Montauk, and the Atlantic Ocean. Each of the Ocean House’s spacious accommodations is inspired by the natural beauty of the surrounding scenery. From its vantage point high atop a bluff, the hotel commands an impressive view of Block Sound. The hotel’s rooms are comfortable and soothing, exquisitely appointed with early 20th-century décor, custom wooden furnishings, a sedate color scheme, and New England artwork. This turn-of-the-century ambiance is combined with high-tech conveniences such as wi-fi internet, flats screen TVs, floor valet panel. iPod docking stations, and in-room iPads. Whether you’re in the mood for a casual beach-side lunch or a sophisticated, three-course dinner, you will find a menu to suit all your tastes at Ocean House. From world-class culinary service and fresh local ingredients to a farm-t0-table ethos, the hotel creates a culinary experience you will not find elsewhere. The resort has its own crew of culinary and wine professionals to cater for their guest’s individual palates. Ocean House is proud to boast talented chefs from all over the United States, each with their unique culinary flare, yet all sharing the goal of excellence in their craft. Each of the in-house chefs creates their own culinary story with emphasis on freshly grown ingredients and Rhode Island dining styles. Rhode Island’s residents and visitor alike are aware that there is no better place to enjoy the wonderful beauty of nature, from the first stirrings of spring, through the vibrant summer, to the changing of the leaves in fall, and roaring log fires on winter nights. Certainly, the beaches are a major attraction, but there are so many things to in Rhode Island, and the Ocean House resort offers many pleasurable activities and events all year round. Not a day goes by at Ocean House without activities for guests to participate in. As well as the many sights and venues throughout Rhode Island and Connecticut, guests can make the most of the many amenities and facilities within the resort. You can take a tour of the resort and enjoy afternoon refreshments, learn some new culinary tips to take home with you, unleash your inner creativity with an art class, keep fit with a workout class, and much, much more. Classes change each month, so there’s always something new to try. One of Ocean House’s latest additions is hand-crafted stave puzzles, which can be enjoyed in the comfort of the hotel’s living room. The pieces are made from layered wood and incorporate features to make the puzzles extra tricky, such as irregular edges and split corners. The Ocean House’s Oh! Spa is Rhode Island’s only Forbes Five-Star spa. The 12,000 square foot spa is the perfect place to enjoy a wide spectrum of treatments including a Detox Marine Mud Wrap, Harvest Body Polish, New England Coffee Scrub, Gentlemen’s Getaway, Couples Experience, and Serenity Escape. The spa also offers a range of specialized nail treatments. These luxuries and delights are just a taste of what Ocean House has to offer. To appreciate the full experience of the elegant resort, you will have to visit and see for yourself. Whether you are traveling solo, with your partner or with your whole family, you will be made to feel welcome and right at home at Ocean House. You won’t want to leave, and you will certainly come back time after time.